Prepare your kids for takeoff, for that's what the Micro G Silencer cushioning feature feels like for children wearing the shoe. The explosive energy of the shock reducing cushion is part of the custom fit and optimal performance Under Armour shoes for kids gives to its young wearers. Children report the shoe is constructed to fit the foot like it was a second layer of skin. The responsiveness and lightness of the shoe will be much adored by kids. Available in youth sizes from 4 - 6. This footwear will feel really lightweight to your kids as they run around the playground or park, as they are enhanced to reduce impact and control the temperature inside the shoe (a big factor in making your child more comfortable). More models of kids' shoes should perform as well as this shoe. Multipurpose training shoes support all-around motion while remaining well-cushioned and durable. ArmourBound midsoles are used for maximum cushioning and support. They shoes also has a non-marking solid rubber outsole, which is designed with a lateral outrigger for enhanced stability. Available in youth sizes from 4-6, as well as in two color combinations - Black/Blue and Graphite/Orange. The Under Armour Assert running shoe features an internal FootSleeve system that gives added comfort and a performance fit for a locked-in feel. A low-profile composition of ArmourBound and ArmourLastic provides maximum comfort that works with the natural efficiency of your child’s foot-strike. Carbon rubber covers the impact and abrasion zones. In addition, durable foam covers the areas that have less tread to give full ground contact and traction without adding weight. Available in sizes 4 – 6 and in two colors: blue or black. While there are more shoe options for boys, there are still several available for girls. There are several colors and styles to shoes from for any little one on your list. 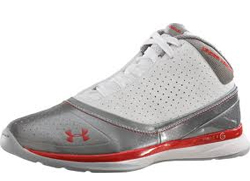 No matter how old your kids are, from infants to grade school children, your young ones will be sporting the newest styles from Under Armour. These shoes are designed to be fashionable as well as outperform their competition. Whichever model you chose, whether it’s the Micro G, the Assert, the Prophet models, or any of their other fabulous models, your children will love them and feel comfortable at their own level of performance.